I’ve had a lot of questions recently about running reports in My Backpack, specifically printing class rosters. By default My Backpack will try to display your reports in its Java-based report preview applet. This almost never works because of all the problems with java in recent years. Browsers just don’t trust Java anymore and in some cases can’t even be forced to run it. So what’s the answer? Just change the output format. At the bottom of the page you submit to generate your report there is an option called “View Report In” which is defaulted to Report Preview. 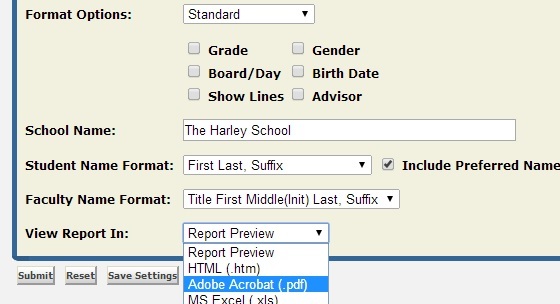 Change this option to Adobe Acrobat (.pdf) and your class roster or other report will open right up in Adobe Reader. You can then print or save from there like normal. This entry was posted on Thursday, August 21st, 2014 at 7:30 am	and is filed under Harley, My Backpack, Senior Systems. You can follow any responses to this entry through the RSS 2.0 feed. You can leave a response, or trackback from your own site.